GENTING HIGHLANDS (THE STAR/ASIA NEWS NETWORK) - With the thick fog and the mist curling from your breath, you would think that you are visiting Europe in winter. But the scene isn't Europe. It is Genting Highlands, just about an hour's drive from the Klang Valley. Visitors and tourists flocked to the resort over the weekend to get a taste of "winter" in a tropical country - and for some shopping. With the temperature dropping to as low as 14 to 16 degrees Celsius in the highlands, many Malaysians also took the opportunity to don winter gear they would otherwise never have the chance to wear at home. Accountant Alan Kua, 32, who was visiting from Kuala Lumpur with his wife, Hui Nee, 32, and their three-year-old daughter, Laeticia, said they loved the cold weather. "Since it is the weekend, we planned to come up to Genting. We love the cold weather and it will be easier for us to shop and walk around. "And since Chinese New Year is just around the corner, we are also doing some shopping," he said yesterday. On Thursday (Jan 11), the Klang Valley experienced the coldest weather it had in months, with temperatures dipping to 21°C. The Meteorological Department said this was due to the effects of the north-east monsoon - overcast sky, incessant rain and cold winds. Police officer Mohd Farhan Jamion, 35, drove from Ipoh with his wife Suhanita Hussain, 32, and their seven-year-old son Muhammad Izz Ferriz. "I really like the cold weather and we can finally use our winter jacket. However, my son kept complaining that it was too cold," he said. Engineer Al-Firman Zahari, 34, from Johor, even brought along his extended family from Jakarta to experience the chilly weather. "Now, we do not have to travel so far to get this kind of beautiful weather," he said. "Although we need to wear jac­kets, I think it is just nice for us to walk around. It looks like winter here, too." For M. Tharani, 22, who is studying at a university in Pahang, the weekend trip with her friends has been a stress reliever. "We want to relieve our stress and the weather is really nice. We are going to check out the new restaurants," she said. However, not everyone was "cool" about it. Housewife Siti Zaleha Abdullah, 53, from Taman Tun Dr Ismail, said the damp was making it harder for her to dry clothes outside. Customers waiting for their clothes to be dried at a self-service launderette in Taman Desa, Jalan Klang Lama. "It's always rainy and cloudy. I need to ask my daughter to bring me to the laundry to dry our clothes," she said. "This will add extra cost to the family's expense." Fitness enthusiast Mohd Razif Abdul Karim, 29, said with the cold and rainy weather, it was harder for him to go jogging. "Usually, I can jog in the park after work but now, it is slightly more troublesome," said the Petaling Jaya resident. 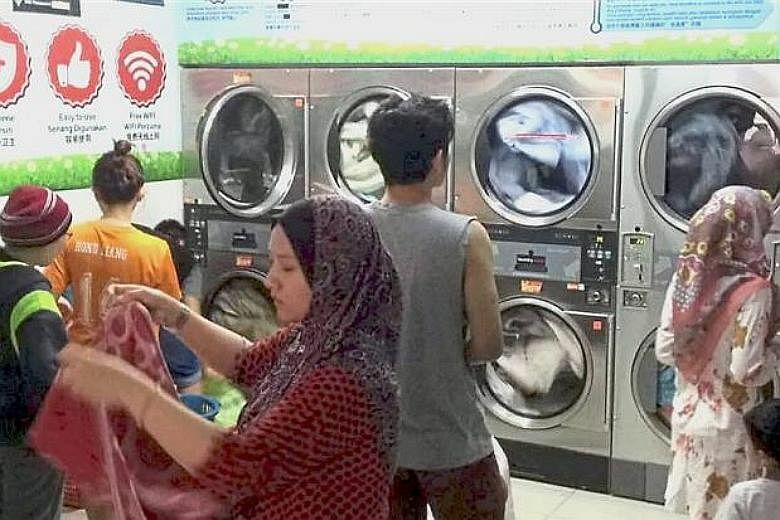 A self-service launderette in Section 17, Petaling Jaya, is enjoying brisk business, with many customers coming in to use the dryer. C.K. Wong said he spent RM4.50 (S$1.50) to dry his clothes for 23 minutes in the machine. "Otherwise, there is a musty smell on my clothes in this type of weather," he said.